Over a decade ago the Kamon family was charged with high crimes against the Lyvanna Province. Seeking to incarcerate the family members, a contingent of soldiers was dispatched to the estate by the Provincial government. A battle erupted between the soldiers and the Manor's mercenary guards. In the end, Kamon was executed and his wife was arrested. Since that time, Kamon Manor has been left secluded and in ruins. Then, after years of silence, the Manor's church bell started ringing. A group of militiamen was dispatched to investigate, but they never returned. Rumours of unearthed graves, strange noises, and other ghastly events have the people of Lyvanna terrified. Is there anyone brave enough to explore the ruins of Kamon Manor and solve its mystery? 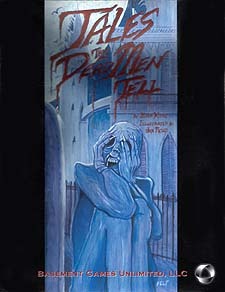 Tales That Dead Men Tell is the second module realease to support the Forge: Out of Chaos RPG. The supplement offers an intricate plot, several new monsters, regional source material, and a variety of hooks and hints to continue the adventure long after the mystery is solved.